Keystone Answering Service has an established track record for attracting talented staff and bringing innovative solutions to clients. Our leadership, management, and staff have always been – and will continue to be – committed to excellence and innovation within our company and the telephone answering service industry. Keystone implements Startel Disaster Recovery & Business Continuity solution for full system restoration. 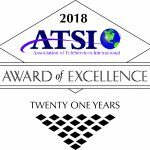 Keystone Agent Sally S. takes the TOP CALL in the ATSI Award of Excellence Program. Company passes Y2K without any issues. The company is first site to Alpha test the precursor Startel CMC on SQL versus iRMX. Company buyout. Chris Bell becomes sole owner.